WASHINGTON, DC -- President Obama said Monday that he would wait for the outcome of peace talks before deciding whether to provide lethal weapons to Ukraine. 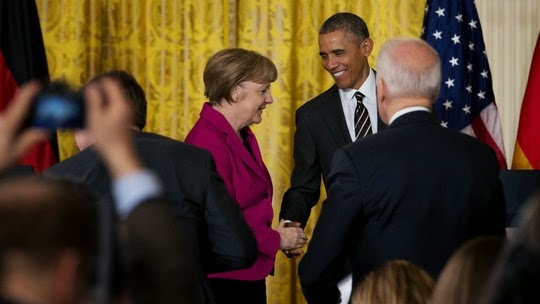 Chancellor Angela Merkel of Germany and President Obama said the alliance between the United States and Europe remained strong, despite potential disagreements on whether to provide arms to Ukraine. Such assistance would represent a striking break with European allies who say that arming the country against Russian aggression would make the conflict worse. In a joint White House news conference with Chancellor Angela Merkel of Germany, Mr. Obama said he was hopeful that economic sanctions would persuade President Vladimir V. Putin of Russia to seize a diplomatic solution. But he said the United States would consider sending defensive weapons to Ukraine if European-led talks scheduled for this week did not produce peace. “If, in fact, diplomacy fails, what I’ve asked my team to do is to look at all options,” Mr. Obama said. Many leaders in European capitals share the Obama administration’s deep distrust of Putin, but they continue to hope that the pressure of economic sanctions will lead him to accept some sort of settlement. But the major Western European countries, including Britain, Germany and France, oppose sending arms. “We continue to pursue a diplomatic solution, although we have suffered a lot of setbacks,” Ms. Merkel said during her White House visit. After a meeting with Ms. Merkel early Monday evening in Ottawa, Canada’s prime minister, Stephen Harper, echoed Mr. Obama’s words from earlier in the day. Although he expressed his hope that diplomacy would resolve the situation in Ukraine, Mr. Harper repeatedly noted that Russia continued to pursue a military approach. The issue of whether to provide more than nonlethal military aid to Ukraine’s army has threatened to cleave what has until now been a united front among the United States and some of its major European allies over how to respond to the Ukrainian conflict, which has been stoked by a steady supply of weapons and soldiers from Russia. But both Ms. Merkel and Mr. Obama sought to play down the impact of a disagreement, saying the international coalition that has backed economic sanctions against Russia would survive such a dispute. “Russian aggression has only reinforced the unity between the United States, Germany and other European allies,” the president said. Mr. Obama signaled his willingness to wait for Ms. Merkel, Putin and the leaders of Ukraine and France to seek a negotiated cease-fire at a meeting scheduled for Wednesday in Minsk, the capital of Belarus. The president’s comments suggested that arguments in favor of lethal aid by some of his senior advisers have made their way to his desk. NATO’s military commander, Gen. Philip M. Breedlove, said at a security conference in Munich on Saturday that if economic sanctions and diplomatic pressure failed to persuade Putin to remove his forces from Ukraine and to stop helping the separatists, then sending defensive arms should not be ruled out. On Capitol Hill last week, Mr. Obama’s choice to be the next defense secretary, Ashton B. Carter, said he would be inclined to support Ukraine with defensive weapons. But he stopped short of saying that the United States would provide lethal weapons. Senator John McCain, the Arizona Republican who is the chairman of the Senate Armed Services Committee, on Monday accused Mr. Obama and Ms. Merkel of a “ ‘more of the same’ diplomatic strategy” and urged them to provide defensive weapons immediately. Mr. McCain said that providing such arms to Ukraine was “an essential component to achieving” a political solution because it would intensify the pressure on Putin to come to the negotiating table. “As Russian soldiers fail to return home from Ukraine, Putin will be challenged to sustain a war that he has told his people is not happening,” Mr. McCain said. Mr. Obama and Ms. Merkel spoke after European foreign ministers agreed to postpone imposing a new round of sanctions against Russia, hoping to avert a rift with the United States over sending arms. European governments decided late last month to expand the list of people under sanctions — those who face the freezing of their assets and travel bans — after pro-Russian rebels mounted a rocket attack on Mariupol, a Ukrainian port city, killing about 30 Ukrainian civilians. The sanctions apply currently to more than 130 Russians and Ukrainian separatist leaders supported by Russia. Laurent Fabius, the French foreign minister, said any future settlement must be based “as far as possible” on the terms of a truce reached last September in Minsk, which fell apart immediately. But he acknowledged that “there have been certain evolutions on the ground” that make a settlement difficult. Russian-backed separatists have captured more territory since September and have said they will never agree to retreat to their previous positions. The sanctions delay will give the 28 nations of the European Union time to review Russia’s willingness to work toward a peaceful solution, Mr. Fabius said. He said a critical issue was whether a firm agreement could be reached to withdraw heavy weapons behind specified lines. Previous agreements have all collapsed. More hawkish countries, notably Britain, have argued against a delay in sanctions. “Until we see Russia complying on the ground, we can’t relieve the pressure,” the British foreign secretary, Philip Hammond, said Monday.